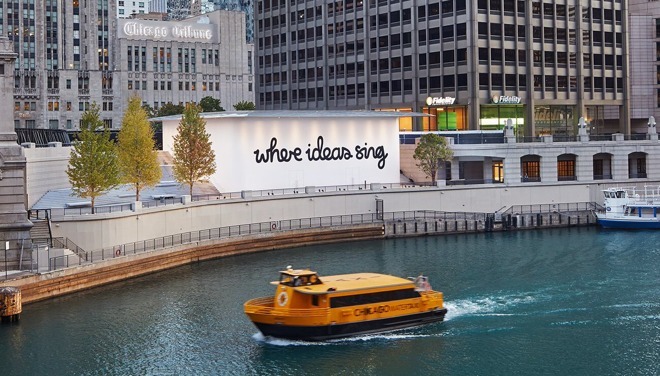 In advance of an Oct. 20 opening, Apple has commissioned a song and matching artwork to promote the new store coming to Chicago's Michigan Avenue. The song, "Where Ideas Sing" by hip-hop artist Saba, is hosted on Apple Music and described as an anthem for Chicago. Its title has been rendered on the store's construction facade using custom typography by artist Matthew Hoffman, as noted on Twitter by Apple retail head Angela Ahrendts. On Oct. 21 at 11 a.m., Hoffman will host a live typography event at the store —reservations begin on Oct. 10. In the meantime the company is also running a special playlist on Apple Music, featuring Saba and other local artists. Apple has made artistic collaborations a common feature of higher-profile store openings, such as its Dubai Mall outlet in the United Arab Emirates. At a Sept. 12 iPhone event, Ahrendts in fact referred to the company's retail chain not as stores but as "town squares," implying a greater cultural relevance.